The Thursday Quiz is also taking the week off. Five contestents managed to score four Stars apiece in the Fourth Season. Cartophiliac led the field with two Golds, plus a Silver and a Green, and thus earns the more-than-usually meaningless title of Fourth Season Champion. 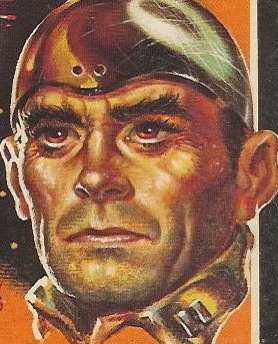 drschnell, with one each of the Stars. karmasartre, also with one each of the Stars. La Gringissima, with two Silvers and two Blues. Phineas, with a Silver, two Blues, and a Green. Mrs.5000 and Karin both snared three Stars during the Fourth Season. And everybody who submitted answers at any time during the Season was of course witty, charming, erudite, and frighteningly attractive. Cartoon image taken, again, from BibliOdyssey. Don't bogart that joint, my friend, pass it over to me. 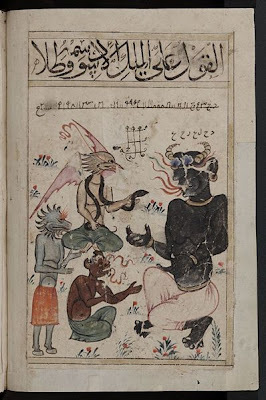 Ba'al is teaching a seminar on "How To Shrug Like an Elderly Jew." Osiris is doing it wrong. Congrats to Cartophiliac and the four star generals. That is good band name. Of course to the Mrs and Karin too. Yep, even the snake agrees. You need a Tic Tac. Excellent contributions all. Stoners, barbershop quartet, shrug seminar participants... what ARE those guys up to? Shouldn't have eaten those habeñeros, horn-dude. I totally wanted to make a caption referencing tic-tacs. Great minds think alike ... and read Michael's blog!